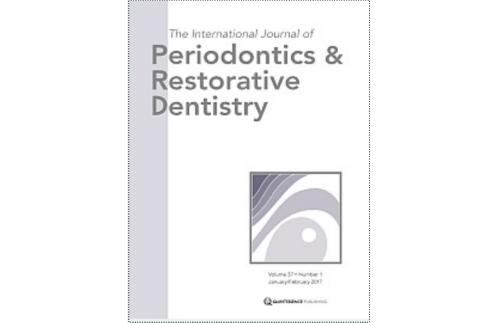 Fabbri G, Brennan M, Manfredi M, Ban G. – Int J Periodontics Restorative Dent. 2009 Oct;29(5):543-7. The use of biodegradable fixation materials or devices during maxillofacial, craniofacial, and orthopedic reconstructive surgical procedures reduces or eliminates the need to perform a second surgical procedure, which would otherwise be required to remove a nonbiodegradable device. This article presents a novel approach to augment a horizontally deficient alveolar ridge using both a resorbable plate/screw fixation system composed of a polylactic acid-polyglycolic acid (PLLA-PGA) copolymer to provide a rigid scaffolding for the bone chips and a resorbable collagen barrier (Bio-Gide, Osteohealth) to secure the graft material. For periodontal reconstructive procedures, such as guided bone regeneration, the clinical application of this technique may be advantageous and also provide a more esthetic result by minimizing the need for an additional surgical procedure. (Int J Periodontics Restorative Dent 2009;29:543-547. ).